I seriously didn't feel right even clicking on this image. 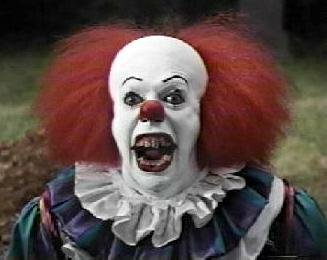 Clowns, Killer – And not the Outer Space kind. Two Chicago lawyers posit that serial killer John Wayne Gacy, who worked children’s birthday parties dressed as a clown, may have had accomplices who are still living. If true, this is quite possibly the most nightmare-inducing thing since the first episode of Normal, Ohio. Houston, Whitney – Were it not for Whitney, fellow Tweedling Tomlin and I never would have witnessed our good friend C. Sayre belt out “I Will Always Love You” loudly and off-key at a rough, divey karaoke bar while having crumpled cigarette boxes and other items thrown at him. For that alone, RIP Whitney Houston. Madonna – According to Madge, singer/songwriter M.I.A.’s gestural f-you during the Superbowl halftime show was a “teenager … irrelevant thing to do.” Says the woman who kissed Britney Spears and Christina Aguilera at the widely televised 2003 MTV Video Music Awards. O’Donnell, Rosie – After precipitous drops in her show’s rating, O’Donnell will no longer film in front of a live audience. That isn’t expected to make a difference, since most of her audience members were probably near death anyway. Robertson, Pat – Televangelist Robertson said in a recent 700 Club segment that the super-popular vampire/werewolf series Twilight is both “evil” and “demonic.” I never thought I’d say this, and it’s probably for completely different reasons, but I agree with Pat Robertson. Vow, The – Barfdramedy The Vow “wowed” box offices with a $15.35 million take this weekend, beating out Safe House, Star Wars I – The Phantom Menace In 3D, and Journey 2: The Mysterious Island. This is what you get in February, folks.